A woman in our ward has a small orchard but does not sell her apples or pears. She and her husband just let as many people that want to come roam their orchard and pick to their hearts content. Lou was in heaven eating the apple straight from the tree. I wish I would have brought my camera. Between that and the two cats, it was better than any park or playground she had ever been to. I am not a big canning person and don't have the tools to make large amounts of applesauce or apple pie filling. So, I brought one bucket. Lydia ate her fair share - asking for an apple every day until I made this butter. 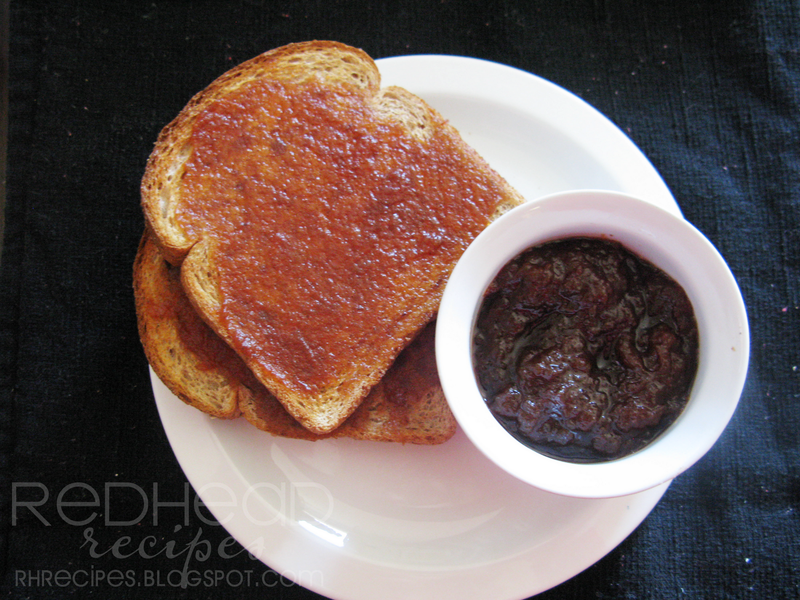 This apple butter is one of the easier recipes I found - no need for making applesauce before hand. Plus, your house will smell delicious for at least a day. If you are lucky like me, you will do it overnight and literally dream about it. This is a very adaptable recipe - use the spices you like or the ones in your house. Oh, and happy Apple Month! Place all items in crock pot, stir until combined. (If it is easier, use a large bowl to mix then dump in the crock pot... that's what I did.) Cover and cook overnight on low. If desired, blend until desired texture. 2. Sorry - I was just peeling away at the apples and didn't really notice how many it took to fill the crock pot, my guess - about 10 to 12. It looks delicious and easy to make! this looks delicious. i'd love to make my own. I just made an apple bundt cake that called for apple butter. Next time I make it I'll be sure to make my own! What size crock pot did you use? I am trying to get the sugar proportions right. Thanks! Anonymous - sorry about that. I have a 2.5 quart size crock pot. I will update that on the post. By the way - if you are worried about it being too sweet, do less sugar then once it has all cooked down, taste and then you can add sugar after. Just wait to cool it until the sugar is dissolved. If your apple butter is still hot it should dissolve pretty quickly. I wanted to tell you that I made this last fall--it was so good. I put some in the freezer to make Dorie's Double Apple Bundt Cake. That is one great cake. I have been enjoying your blog for the last 30 minutes and have several recipes bookmarked. You are now on my reader so I can keep up with your yummy cooking.